Eye protection is really important specifically when you are in snowy mountains when the sun is shinning or if you are on the water. I made some trips without sunglasses and I really can say it is a big pain for your eyes when they are not protected. After a trip without sunglasses it was time to find the right one for me. I ordered different glasses to find out which suits me best. In the end I bought a Julbo Bivouak Spectron 4, because I got a great deal from the Bergfreunde and these glasses fits best. The Julbo Bivouak Spectron 4 weighs 32g with glare shield and headband. This as an acceptable weight and light enough to get no problems when you wear the sunglasses the whole day. 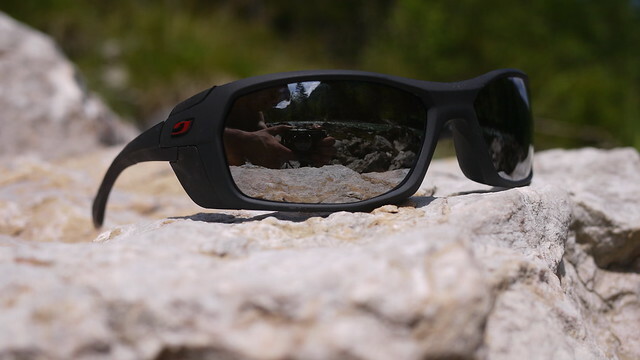 I’m using my Julbo Bivouak Spectron 4 sunglasses round about two years and I’m really satisfied with them. 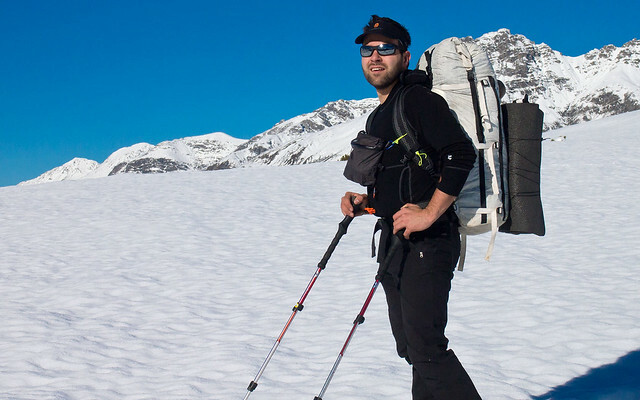 They accompanied me on several packrafting trips and last winter on three trips in the Swiss mountains. Of course on every trip during the sunny summer month. After a short time of use I removed the glare shields because I really did not need them. These are the small parts which you can loose on a trip and later at home you are annoyed about this. I also do not use the headband, because I hate it when something is flapping around in my neck. Ok coming now to the glasses. The frame of this glasses is fantastic. It fits perfect on my nose and slightly around my head. The earpieces are very small and the Grip-tech end is very soft and can be adjusted easily. For hiking I prefer a loose fit of the glasses and for action sports like biking or packrafting I form the earpieces a bit that I cannot loose the glasses. The nose part of this frame has no extra soft grip area, but the glasses stay in place even when I’m sweating a lot. After wearing the Julbo a day long you have some small imprints on your nose which are not too bad. 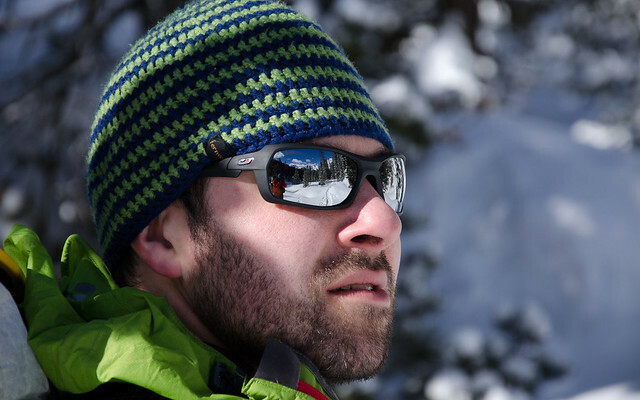 The Julbo Bivouak Spectron 4 is also close enough and protects your eyes perfect against heavy storms and snow and the field of view is big enough to see everything around. The Spectron 4 lenses are splendid, but not for all activities useful. On my last wintertrips in the swiss mountains I was happy zu have these category 4 lenses, because was sun was very bright and was also reflected by the snow. If you would use category 3 lenses under these conditions walking would be no joy, because you would blink with your eyes the whole time because the sun is so strong. These effect you also have on the water when you are packrafting or do other water sports. With these lenses you are perfectly protected and you can notice details in snow and in moving streams without any problem. On bike trips I made mixed experiences with the category 4 lenses. When the sun is shinning they are perfect, but when when you riding with your bike from the sun into the shade you can problems. The lenses are too dark and your eye is not fast enough to switch from light to dark. So you could get problems to see what’s in front of you when you are biking through a shady forest. Overall I can say I’m satisfied with these sunglasses. Just the case where you can carry the sunglasses is a bit too big. A smaller one would be better on trips, but most of the time I’m wearing the glasses and need no case. 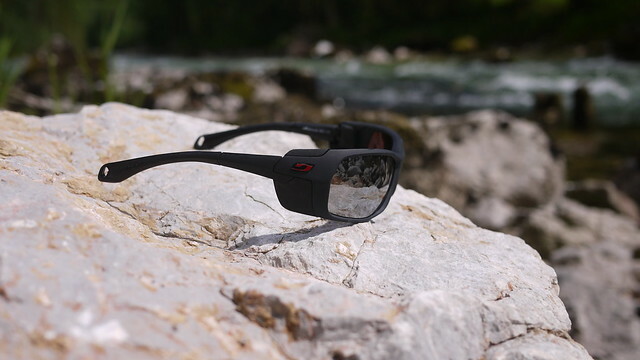 You get a good sunglasses for an excellent price-performance-ratio. Furthermore you could save some grams, but then you have have to pay more than twice the price of this Julbo. Before I would so much for a lighter one I would replace the Bivouak Spectron 4 and buy one with cameleon lenses like the Julbo Whoops Chameleon. Get your Julbo Bivouak Spektron 4 from the Bergfreunde. I have the Bivouacs with Cameleon lenses. Sometimes I wish for a darker lens in winter, and I’m not so keen with the colouring and polarisation, but all-in-all I agree, they’re pretty good shades. I like that you can adjust the arms easily to get a tighter fit, and the removable glacier clips are nice. The Cameleon lens is superb because you can also use these sunglasses when you driving with the car. Driving with category 4 lenses are forbidden. Which category do you have in your cameleons? 2-4?? I don’t remember, but probably the 2-4s. Unfortunately I wear glasses for driving, so sunglasses are problematic. Those glasses look cool! I have the Julbo Dolgan glasses. Do those Cameleon glasses really work? Wy fie has some Uvex Cameleons and they worh excellent, but these glasses with a category from 1-3.